With this issues focus on the Latin American and MENA markets, one of the most interesting news items deals with Rio de Janeiros win of the 2016 Winter Olympics. Companies who bid for, and win, the broadcasting rights to the 2016 Summer Olympics in Rio de Janeiro are certain to enjoy substantial profits, and Latin American countries and communities are already celebrating this award by the Olympic Committee. The Satellite Industry Association (SIA) submitted the following comments in response to the Notice of Inquiry in the above-captioned proceeding.1 The Commission seeks input on the factors that encourage innovation and investment in wireless and concrete steps the Commission can take to support and encourage further innovation and investment in this area.2 While the Notice of Inquiry appears largely focused on terrestrial-based services, any meaningful evaluation of the wireless ecosystem must also account for the dynamic innovation and investment occurring in satellite operations, services, and technologies. 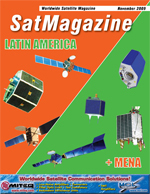 Euroconsult, an international research and analyst firm that specializes in the satellite communications sectors, announced that revenues of mobile satellite service operators grew to more than US$1.2 billion last year, despite the adverse impact of the economic crisis on some of the industrys key vertical markets. Industry wholesale revenues are expected to continue growing over the next decade, by a rate of 8 percent (10-year CAGR). According to Euroconsults just-released report Mobile Satellite Communications Markets Survey, Prospects to 2018, the MSS industry is currently at a crucial point, with growth opportunities ahead. However, a number of operators with high capital requirements face a difficult financing environment. Earlier this month, ViaSat announced that it was acquiring WildBlue Communications for $500 million, net of cash acquired. Given that ViaSat itself isnt really all that much bigger, with an enterprise value in the US$875 million ballpark, this is clearly a big deal for them. But is it the right deal? And are there other winners and/or losers? Lets see! In numbers, 99 active Direct-to-Home (DTH) platforms were broadcasting over 13,800 television channels to more than 114 million subscribers at the end of 2008, generating more than US$65 billion in Subscription Revenues. At blended average revenues of US$47.75 per month, viewers were being treated to High Definition (HD), Digital Video Recording (DVR), Video on Demand (VOD) and Triple Play services like never before. INSIGHT: 6 Steps To A Profitable Marketing Plan, by Andy Marken, President, Marken Communications, Inc.
New ideas are almost a dime a dozen. Theres an innovation on almost every street corner. When the commercialization of SATCOM began in the mid 60s, telecom service providers and users alike were quick to realize the benefits satellite-based communications had to offer. Long before the introduction and proliferation of optical fiber, intercontinental communications was relegated to the use of low-capacity sub-oceanic copper cables or hand-delivery of the written word. This article, authored by Chris Stott, the Chairman and CEO of ManSat, is excerpted from Near Earth LLCs newsletter, with permission from the author and the publishing company. For most digital TV operators, the Conditional Access system is a vital component in a successful and profitable operation. Without the ability to encrypt the signals and thereby limit access to paying customers that a conditional access system provides, a broadcaster cant generate the revenue potential locked up in the content. But while most operators have personnel with traditional broadcasting skillsets, and knowledge of MPEG, DVB and networking, conditional access systems tend to be proprietary, and surrounded by a lot of secrecy. Arqiva operates at the heart of the global broadcast and mobile communications industry. With a heritage dating back to the start of ITV in 1955, the company has played a leading role in the introduction of digital terrestrial television and radio in the U.K. Arqiva today provides much of the infrastructure behind television, radio, and wireless communications in the U.K. and has a growing presence in Ireland, mainland Europe, and the United States. Within Arqivas worldwide footprint are an award-winning infrastructure of 10 international teleports in cities including London, Washington D.C., Los Angeles, and Paris; more than 100 Earth stations; and a global terrestrial fibre network. PRODUCT PERSPECTIVE: The Vision For Airborne Broadband, by ARINC Inc.
ViaSat ArcLight technology builds a network  and business case  for in-flight broadband to business jets. With a 75-year history in communication networks for aviation, ARINC knows the performance aviators demand and the strict guidelines the industry maintains. That was the environment ARINC faced in seeking to bring broadband data connections to business aircraft. Advantech offers a two-way, open standard (DVB-RCS) broadband satellite access system. SatNets DVB-RCS Hub, and in particular its Return Link Sub-System (RLSS), is at the heart of the broadband access system. George Gonzalez is responsible for XStreamHDs vision and mission, as well as the successful achievement of its business, production and technology goals. This Executive Spotlight focus is on Patrick Shay, a Telematics and LBS industry pioneer with more than 20 years background in the GPS and wireless marketplace. He led the sales and marketing efforts on a global basis for Motorolas GPS and Telematics business. His team launched the Telematics business in Europe and the U.S. with General Motors OnStar, Fords Lincoln RESCU (the first Telematics program in 1995), Nissans Communicator, BMWs Mayday. and Mercedes-Benzs Teleaid in Europe and the U.S., as well as Opel, Vauxhall, and Renault. These programs created a new US$1billion business for Motorola. The space industry probably has the most demanding requirements of vibration testing anywhere in the world. Given the huge stresses involved in the launch of the payload, and the fact that you cannot easily repair a damaged system (satellite) once it has been deployed, its best that the system has been thoroughly tested before launch!